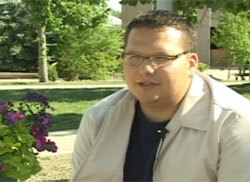 Kelly Quewezance is a member of the Keeseekoose First Nation in Saskatchewan. He has a degree in Social Work from the University of Regina. In the video clips he describes his role in distributing Treaty Annuity Payments as the North Band Governance officer of Indian and Northern Affairs Canada (INAC). Video 1: What can you tell us about your education background? Video 2: What is your position with Indian and Northern Affairs? Video 3: What role does math play in your career? Video 4: Describe your role in distributing the treaty annuity payments. Video 5: What advice would you give students? Video 6: Who were your role models?